Tutorsville.net respects the privacy of all its users and customers, and we strive to ensure that your privacy is protected. We never release any user personal information or share it with third parties, including credit card information. Every transaction made at tutorsville.net is processed securely through the 2checkout online payment system, ensuring that none of your credit details are disclosed to third parties. When you purchase with us, you will need to enter your personal information in our order forms, such as your name, contact details, phone number and e-mail address. This personal information is used solely to contact you with regards to your purchase - we never use this information in any other way, such as providing or reselling your details to a third party. If you contact us by e-mail for general enquiries, feedback, issues or complaints, the information you provide is used only to reply to you and help with whatever you are looking for, and is not used in any other way. Like most other servers, our servers log your IP address, operating system, time of visit and browser type. You can set your browser to accept or deny cookies. Cookies make your browsing experience more personalized, but if cookies are denied, the website may not function properly. We provide many links to external pages that you can make use with. Having said this, Tutorsville.net is not responsible for external site content. If you are unsure of any external links, please read their privacy statements and disclaimers for more information. After signing up, go to the Pricing page and choose the tutoring package most suited to your needs. 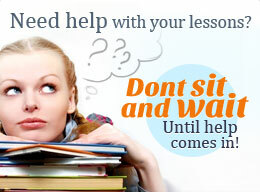 Just a tip, the more time you buy, the more free tutoring time you will earn. Trial lessons are also available at $9 for 30 minutes. Enter your registered email and password to log in. In your account, you see Request New Lesson. Click it. Provide the specifics of your tutoring request (subject and the questions to be asked or home works to be finished) and specify the desired time of the tutorial session. After getting the confirmation from the tutor, enter the online classroom, which is a simulation of a live classroom. Here you interact with your chosen tutor—you get to chat, go over assignments with your chosen tutor. This facilitates better and more effective learning.